If you print a sign to promote a new service, and then you never hang it in the business, you’re missing an opportunity, right? That seems pretty clear, and yet business owners think nothing of buying a TV and filling it with useless programming. But how is that helping your business and customers? There is an important reality about including a TV in your business location: your business is not the customer’s living room. They have a TV in their own living room and they have complete control over that one. Having a TV in your business with the remote freely available is not going to draw anyone off their own couch to come sit in your waiting room. You may have a television in the waiting area of your doctors office or automotive service center. And you might leave the remote out for your customers to pick what they want to watch, but why? Did a customer ever say “I feel like watching the Steelers game, so I’m going to the doctor’s office”? Of course not! Additionally, leaving the channel selection to your customers poses some risks. What will they choose to watch? Will they be annoyed by the preferences of the other customers? Some business owners who hold the remote at the desk or behind the counter complain that dealing with changing the channel wastes time and frustrates employees also. The truth is that you designed your business location with purpose. The paint color, the flooring, the lighting, the furniture: you selected these to create a certain feeling in your space. Until now there were very limited options to customize your TV with that same care, but now you can. Your TV can influence your customers to spend more money, come back more often, and follow your business on social media. Choosing the right programming is all you need to do to make your TV worth something. 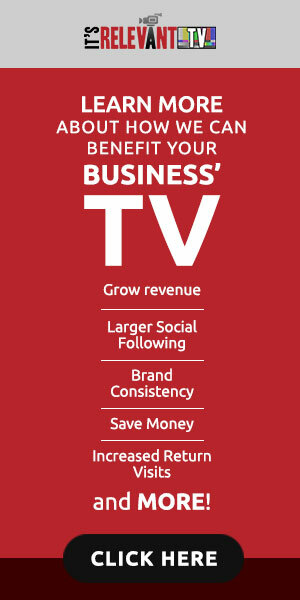 With It’s Relevant TV, your TV is an asset that helps drive greater sales. Whatever channel you have on, your customers will look at the television at least once – it’s human nature. But how can you keep them looking without giving them the remote? Keep changing the type of content every few minutes automatically! If you have national news, sports, travel, gardening, food/cooking, fashion, kids programming and more available to mix at all times, you’ll have something for everyone. It’s Relevant TV is the subscription service that provides you this flexibility. The system automatically mixes content from categories you choose so your customers are never bored or frustrated with what’s on the TV. When your customers are looking at something, you put your brand on it, right? Custom water bottles, notepads, refrigerator magnets, this is a pretty common practice. With your TV, you have the opportunity to do so much more! Put your logo on the screen, add your own informational videos, and add your own marketing messages and specials as images next to the broadcast. Show off your social media posts to gain followers. All of that would be impossible with cable TV. It sounds like a promotional dream, but it’s very easy to achieve with It’s Relevant TV. Get your customers to look, keep them watching, and harness their attention to grow your business.